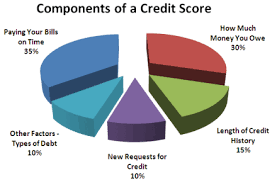 The first step in getting a handle on a bad credit score is to understand your credit report and credit score. If you’re not familiar with these two things, be sure to check out the Credit Report and Score article I wrote a while back. Once you have a good understanding of the two and how they’re related, you’re in a good position to tackle the problem. Why Is a Bad Score a Problem? Lenders charge you higher interest rates on any loan or credit card to account for the risk they’re taking on you. This will have a direct impact on what you can afford to buy. Some utility companies will make you pay a security deposit if you have a bad score since they doubt your ability to make regular payments. Cable already costs enough! If you’re applying for a management type position, it’s possible the employer will check your credit report to see if you have any red flags in your financial past. Think bankruptcy, bounced checks, etc. Bad credit can also hinder your ability to get security clearance if the job requires it. You can flat out get denied trying to apply for a loan, mortgage or something as simple as buying a car. Harassing calls from debt collectors are a drag. They can also cause a lot of stress in relationships. Landlords are reluctant to rent to people with bad credit. Given the choice between you and someone with good credit, you won’t get the apartment. Trouble getting a cell phone since carriers don’t trust you to not rack up a huge bill and disappear. Insurance can be more expensive since insurers view you as more likely to make claims. The stress of being in a bad financial position over a long period of time affects your physical and mental health. Convinced you should fix it? Good. Fixing your credit is not going to happen overnight. You see ads from lenders or “credit experts” all the time that say things like “Bad credit? No problem!” or “Erase your bad credit today!”. Do yourself a favour and ignore these scams. This is going to take some time and effort, but there’s no better time than now to start doing the right things. It’s one thing to not pay bills because you’re short on funds. It’s a whole other thing to not pay them because you don’t know when they’re due or you forget. Find out when your payments are due, and add reminders in your electronic email / calendar application (Outlook, Gmail, etc). If you can setup automatic payments, do it. Figure out what the interest rates are on your outstanding loans and credit cards, then pay the balances with the highest rate first. Also give attention to your cards that have a balance higher than 50% of your limit (more on this later). Once you get your credit report, you might be able to identify errors that are negatively impacting you. Whether it’s the credit reporting company or the organization you did business with, they need to talk to each other to fix it. Contact the reporting agency and the creditor to provide information on the error, supporting documentation and your contact info. They will launch an investigation and start working to fix the error assuming it’s legitimate. Once resolved, you can ask them to send notification to anyone who has asked for your report in the last 6 months. Having a long credit history with lenders helps other lenders determine if you’re a good credit candidate. If this history includes you paying on time, that helps too. I’ve had the same two credit cards for over ten years. I use one daily and pay it off on time, and I don’t use the other unless it’s an emergency. Don’t apply for a new card every few months because there’s a new perk or your favourite sports team came out with one. If you’re constantly applying for new cards, it’s a strong signal you don’t have money and won’t be able to keep up with payments. Most financial institutions now offer products like secured credit cards (BankAmericard Secured, Capital One Guaranteed Secured Mastercard) and credit builder loans that help those trying to establish or repair their credit history. I haven’t used these products myself, so do your own research, but the idea definitely makes sense. WalletHub actually have a great free tool that provides information on some of the secured credit card providers. It includes information on rates, minimum deposit, and fees. They don’t cover all cards, but it’s a good starting point and gives an idea of what rates you can expect. Sounds counterintuitive, but increasing your limit helps your score. Just make sure you don’t also increase how much you’re putting on the card. The credit agencies want to see a healthy spread between the limit and the balance. The technical term for this is your credit utilization ratio. If you do change cards, keep the old one and don’t use it. The unused available credit mentioned above helps your credit utilization ratio as well. Get a low interest rate loan and pay off your credit cards that have balances you can no longer manage. Note that this only works if the credit cards have higher interest rates which is likely. Talk to the institutions your have issues with and make them aware you want to fix the problem and that you are willing to work with them. There is no harm in asking for lower rates. At worst they say no. At best you slow down the growth of your debt. If you’re able to start doing the above, and do it over a long period of time, your credit score will only go up. You just have to start somewhere. In as little as 2 or 3 years, you’ll start to see your score climb.